I was walking in the Yukon one evening when I heard a commotion in the forest. At the time, I was working on my PhD under the supervision of Stan Boutin at the University of Alberta as part of the Kluane Red Squirrel Project. This meant that I spent a lot of time hiking on my study area monitoring the red squirrels that I was working with. It is common to hear squirrels calling because they are pretty chatty, but this commotion was different: this squirrel was very upset. I walked quickly towards the calls, arriving to find a female squirrel yelling at her male next-door neighbor, who had intruded onto her territory. This is unusual, as squirrels live solitary lives and are usually respectful of each other’s boundaries. However, as I watched the male’s intentions soon became clear because within seconds of my arrival the male killed one of the female’s pups. I realized that I had just witnessed infanticide. Infanticide is when an adult kills the young of their own species. I later found a second dead pup from the same litter, whose wounds were consistent with the infanticide that I had watched. The whole litter eventually died and their mother, the female I had seen yelling at the male, later had a second litter that summer. I was able to show using genetics that the male who killed the pup was not the father of any of the pups in the first litter, but that he was the father of all of the pups in her second litter. This is an example of sexually-selected infanticide: this is when a male kills another male’s offspring in order to increase the chances that he’ll be able to father kids of his own when the female breeds again. I was fascinated by this behaviour, so I decided to explore it in more detail in our paper that was published today in the journal Ecology. I found evidence that this behaviour is linked to fluctuations in white spruce cones, the main food that red squirrels eat. My colleagues previously showed that red squirrels can predict the future cone availability. The cones mature in autumn and at that time they can be harvested by the squirrels to be stored in a cache on their territory called a midden. Squirrel pups strike out on their own in the fall and during a bumper crop, called a mast year, they have a really good chance of surviving the winter because there are lots of cones for them to harvest and cache. Very few pups are able to store enough food in non-mast years so few of them will survive. Having access to cones is really key for pups to survive. Squirrels are strategic and they can predict the future cone availability. During a mast year, the females will have more than one litter because they know that their pups will have access to cones once the fall arrives, and thus the pups will have a good chance of surviving. The females respond to masts in this way even though they breed in the spring but the cones aren’t available until autumn. In contrast, during non-mast years they will typically have only one litter. I showed that litters die more frequently during mast years, suggesting that infanticide is more common during mast years. When litters die, their mother is more likely to have a second litter and will breed again sooner than if her litter had survived. So male red squirrels commit infanticide in mast years because the females will have that second litter, giving the males a second chance at fatherhood. Two Canada lynx kittens from a family of five captured on a remote camera in Kluane, Yukon Territory last summer. 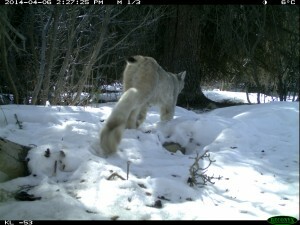 When food is abundant, lynx have big families, like this one. When food is not abundant, females have fewer kittens or may forego having kittens altogether. Kittens stay in their mother’s den for several weeks after birth in May. In the peak of the summer, they begin to explore the world outside their den. This camera captured images of the family on one of its first trips out of the den. Females will soon be establishing new dens and having new litters of kittens in Kluane. 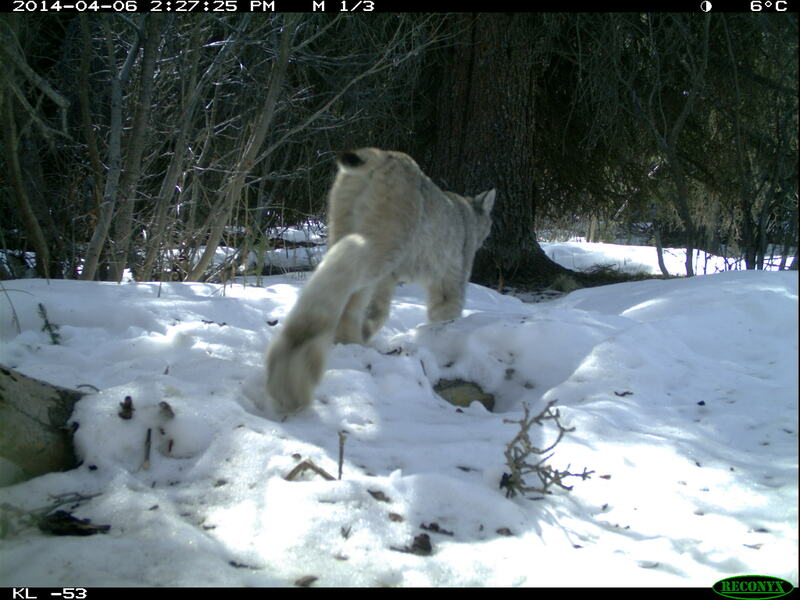 Food is abundant for lynx in the study area, and researchers expect big families again this year. Photo and post by Darcy Doran-Myers. Field assistant Bailey, Kluane resident Peter Upton, and Bubba the dog snowshoe across the ice on Kluane Lake. I spent January of this year in the boreal forests of Kluane, Yukon. My goal was to collect pictures, fur samples, and tracks of Canada lynx in order to estimate density of lynx in the Kluane area. My Master’s project compares methods of density estimation to improve lynx research and management. Every few months I head to my field site in Kluane. I have experienced every season of the year in the Yukon, from the midnight sun in summer to the deep dark and cold of winter. No time of the year is quite like January. Most of my time in Kluane, regardless of season, is spent hiking. This becomes particularly challenging in winter. This year, temperatures dipped to -35 Celsius and snow was thigh-deep in many places. Bailey (my field assistant/ hiking buddy) and I looked to lynx for advice on how to traverse long distances in deep snow. Lynx have disproportionately large feet, making them look funny in summer but helping them keep up with their prey in winter. Their feet function as snowshoes to distribute their weight and help them float on top of the snow. So, Bailey and I got some snowshoes. Not just any snowshoes; modern, lightweight snowshoes were ineffective in snow that deep. In order to make it to all our remote cameras and fur snag sites, we had to borrow extra-large, old-school snowshoes from a local outdoorsman. After a steep learning curve where we learned to walk without tripping (sometimes), the snowshoes became indispensable to our everyday hikes. Cold temperatures were less easily dealt with. Lynx grow big fur coats every winter, with a beard around their neck for a scarf and thick fur between their toes for boots. All Bailey and I could do was outfit ourselves in the human-made substitutes. No matter how much we layered up, we still lost heat throughout the day and had to manage it as best we could. When temperatures were low, lunch breaks to eat our (frozen) sandwiches were limited at five or ten minutes, or until the cold caught up to us. Taking off our mittens even briefly to check cameras or to make a note was painful. Camera screens wouldn’t work, handheld GPSs would turn off mid-hike, and even pen ink would freeze. The Yukon cold did not make our fieldwork easy. A Canada lynx notices a remote camera set atop a ridge in Kluane. Despite the deep snow and the deep cold, Bailey and I headed outside each day to take advantage of every hour of daylight available. A key lesson that I learned this field season is that tough conditions are not as tough when you have a friend by your side to experience it all with you. Long sunrises and sunsets, Northern Lights to light up the night, and expansive white landscapes can help counter the extreme conditions with extreme beauty. And the real reward for the tough times was a lot of data. We collected about 250 pictures of lynx and 100 fur samples for analysis in that month. 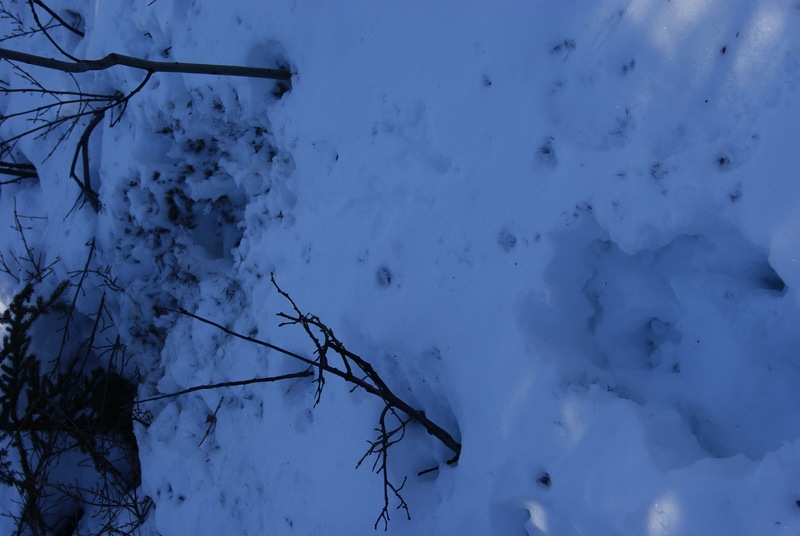 Every successful camera or fur snag and every lynx track in the snow is another piece of the puzzle to understanding lynx populations and improving our management of an ecologically, economically, and culturally important wildlife species. The sun rises at 10 AM and lights up the sky above the Alaska Highway. And I want to go back- and I will. This striking male spruce grouse was spotted in the boreal forest in the Yukon. In the spring you can hear the sounds of their displays as the males show off for the females at the start of the breeding season. This one was photographed by Jessica Haines while she was working with the Kluane Red Squirrel Project. A male red squirrel killed by a bird of prey in the Yukon. He was found far from his territory during the breeding season, likely looking for breeding opportunities (ie. checking out nearby female squirrels). 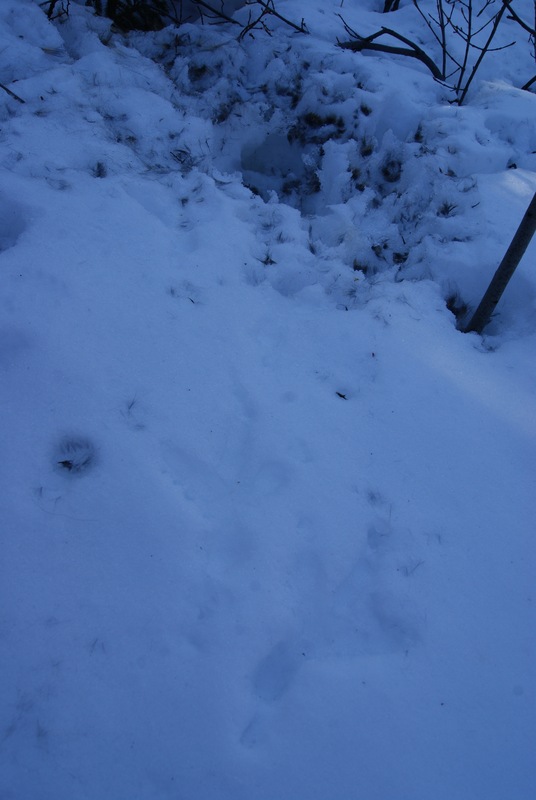 Thanks to the snow you can see the hole where the bird caught him, then bird tracks leading to the spot where he was eaten. We occasionally find red squirrels killed by predators and try to use evidence at the kill site to tell who did it. It’s not common that the tracks are so nicely laid out like this – this story was pretty clear. Goshawks and great-horned owls are the main avian predators of red squirrels in this part of the Yukon, while lynx is the top mammalian predator. Post and photos by Jessica Haines, taken during her fieldwork with the Kluane Red Squirrel Project. A trail camera set close to the ground in order to snap photos of red squirrels instead gets a nice shot of a lynx casually strolling by. 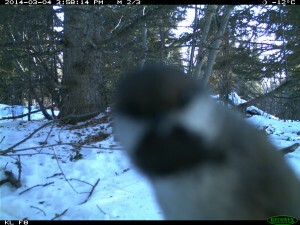 The camera was set up in the Yukon by Jessica Haines as part of research with the Kluane Red Squirrel Project.